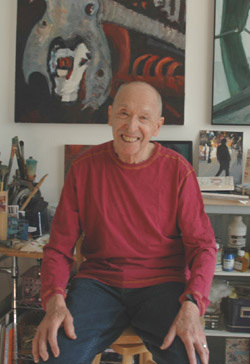 Bern Landis received his BFA with a major in painting and drawing from Purchase College, SUNY. He grew up near the Atlantic and has always been fascinated by rocks, the sea and skyscapes. Along the course of events, he obtained a Ph.D. in Psychology at the New School University and his post-doctoral training in psychoanalysis from New York University. He was in private practice for 42 years, while on the faculty of Cornell University Medical College and on the staff of New York-Presbyterian Hospital. Statement: For all painters, nature affords endless composition opportunities. For myself, I gravitate toward chaotic-appearing rocks, cloudseven junkyards and scenes of disasterand attempting to find some structure in the chaos, I paint the organized perception. The hues and composition reflect my perceptions and what they activate within. Thus the palette may not be close to local colors since I paint primarily what I experience.